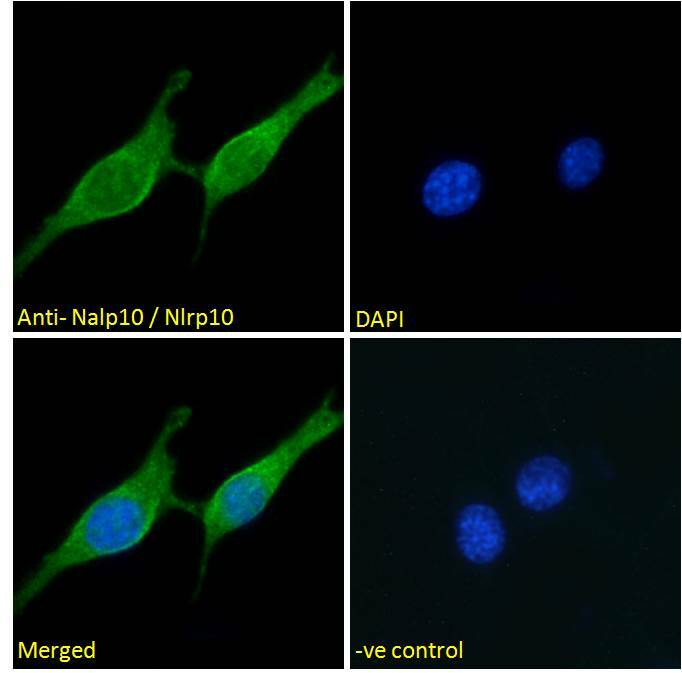 EB11473 Immunofluorescence analysis of paraformaldehyde fixed NIH3T3 cells, permeabilized with 0.15% Triton. Primary incubation 1hr (10ug/ml) followed by Alexa Fluor 488 secondary antibody (2ug/ml), showing cytoplasmic staining. The nuclear stain is DAPI (blue). Negative control: Unimmunized goat IgG (10ug/ml) followed by Alexa Fluor 488 secondary antibody (2ug/ml). 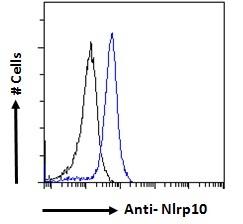 EB11473 Flow cytometric analysis of paraformaldehyde fixed NIH3T3 cells (blue line), permeabilized with 0.5% Triton. Primary incubation 1hr (10ug/ml) followed by Alexa Fluor 488 secondary antibody (1ug/ml). IgG control: Unimmunized goat IgG (black line) followed by Alexa Fluor 488 secondary antibody. Peptide with sequence NDLEENSFKTLKFH-C, from the N Terminus of the protein sequence according to NP_780741.1. Immunofluorescence: Strong expression of the protein seen in the cytoplasm of NIH3T3 cells. Recommended concentration: 10µg/ml.